The AMK Marine 200 is perfect for short trips on inland waters. Contains enough supplies for boats carrying 1-6 passengers. 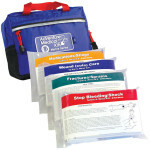 Upgrades from the Marine 100 include: Easy Care organization with injury-specific instruction cards, a durably nylon bag, and a wider array of medications and dressings. Adventure Medical Boating First Aid: Marine 200 - 0115-0200.